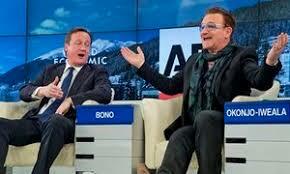 Why do we hate Bono & Geldof? 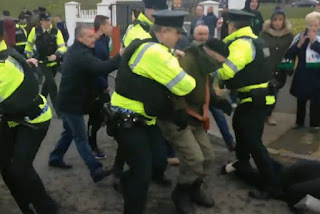 I have mentioned before in my blog that Ireland is suffering from National Stockholm syndrome and that there is an inferiority complex issue, no one illustrates my point more adequately than the much maligned and Irish hate figure Bob Geldof. Irish people get outraged at Geldof; his continual revisionism is downright offensive to some people. Geldof is an attention seeker, a side effect of dealing with a major inferiority complex, paradoxically people who suffer with an inferiority complex often times manifest symptoms of a superiority complex which would explain his arrogance. Cultural Cringe is an internalised inferiority complex which causes people to dismiss their own culture as inferior to the cultures of other countries. Bob Geldof has certainly shown this in abundance. His handing back the freedom of Dublin, due to his outrage at sharing such an honour with Aung San Suu Kyi due to the ongoing Rohyinga crisis and her handling of it, may to some seem more than hypocritical, considering he is more than happy to be a an honorary knight of the British Empire. The very notion of empire is offensive, The British Empire that was built on the backs of slaves, occupation theft, murder and oppression and let us not forget that it was the British Empire who introduced the concentration camp – all this Bob Geldof is apparently OK with. So aside from the obvious hypocritical nature of his viewpoint what is it that makes it OK to turn down an Irish Honour, which let’s be honest is nothing like an OBE, but accept with open arms and gratitude an honour bestowed by the British Monarchy. It is cultural cringe! Geldof wouldn’t want to offend the British, he views them as superior and worthy, whereas the Irish can be insulted and ridiculed because we are thickos and sure he knows better, he has been enlightened into our backward ways and thoughts by years spent in England. So ingrained into the British Culture that he has adopted, he took a leading role in opposing Brexit, not for any of the reasons Irish People may oppose it, but because he is number 1 Englishman these days, who can forget the pathetic sight of Geldof and Nigel Farage sailing about on the Thames trading insults to each other over the EU Referendum. He was a no campaigner for Scottish Independence and memorably likened the 1916 patriots to ISIS Jihadis, Geldof is a true Brit, when talking about Westminster and British Politics he says “we” and has declared “the United Kingdom is one of the greatest ideas for the modern age” and people wonder why the Irish hate him! Now let’s not just be picking on poor oul hangover face Bob Geldof, he is not alone in being a self-hating Irishman, his good mate Bono joins him in the ranks. 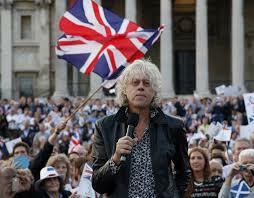 Like Geldof he too has accepted an honorary knighthood from the British Monarchy. Many will know the U2 song Bloody Sunday, a direct reference to the murder of 14 innocent Irish Civilians in 1972 by the British Army, when talking about it U2 cannot bring themselves to condemn the murder or offer condolences, instead he focuses on the condemnation of all violence and openly condemn the IRA!! Ignoring entirely the events from which he takes the title of his song. Of course when David Cameron gave an apology in the House of Commons nearly 40 years later, self-appointed spokesperson Bono sycophantically heaped praise on him, Bono has condemned many incidents in Ireland, The Omagh Bomb, Enniskillen etc but not once have I heard him outright condemn the British Army for their atrocities. His moral outrage is reserved only for his fellow Countrymen and not those who have occupied us. Only on Sunday Past, the once self described aggressive Pacisift Bono, dedicated the song "in the name of love" to the British Military. The admiration he has for the British Government and Military does not allow for him to condemn them, it was all the stupid paddies fault! At a recent concert in July Bono thanked the British for “looking after” Irish Immigrants “Us Irish are immigrant people and of course we came here into this great, Great Britain and we thank you for giving us safety and sanctuary for all these years” he said, conveniently forgetting the rampant anti Irish sentiment prevalent in British Society in years gone by and the torture and internment of Irish Citizens by the British Government such as the Birmingham 6 and Guildford 4. Of course in Bono and Geldof’s eyes us Irish need looked after, we are not fit to run our own affairs, and we need the British to come in and adult the situation. We don’t know what is good for us. Now Geldof, Bono and the rest of this crew will put our criticisms down to begrudgery, so self-assured are they in their righteousness, we are all just jealous backward types. 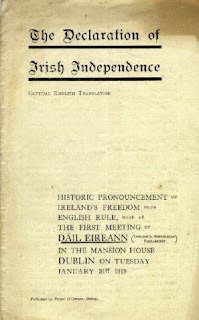 But it is far from this, for centuries we have been oppressed, our culture driven underground in an attempt to properly colonise and own us, it has worked to such an extent that even some Irish people as evidenced by Geldof and Bono have bought into this notion that we are inferior. Colonialism is successful when you can get the natives on board with it and by God have they got two brilliant ones with Bono & Geldof! Cultural Cringe in Ireland is not a new phenomenon; it is part of the colonial/slave mentality and goes back centuries. 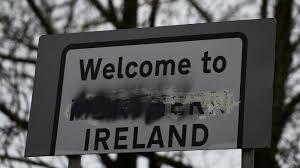 It has affected many areas of Irish Culture from Irish Language, music and dress to even some people modifying their accents! While I use the term Cultural Cringe or slave mentality, I think the good old fashioned “West Brit” sums it up perfectly.